Zombie plague sweeping the land of Minimates! New York Comic-Con 2011 Exclusive! Limited edition 2-pack of Minimates! A plague is sweeping the world, one that turns the dead into ferocious, gnawing creatures who desire only to feast on the living. No one is safe, not the doctor who tries to stem the tide of death, and not the biker who counts on his brute strength to save him. They are only the beginning, the first of many. Soon, they will be legion. 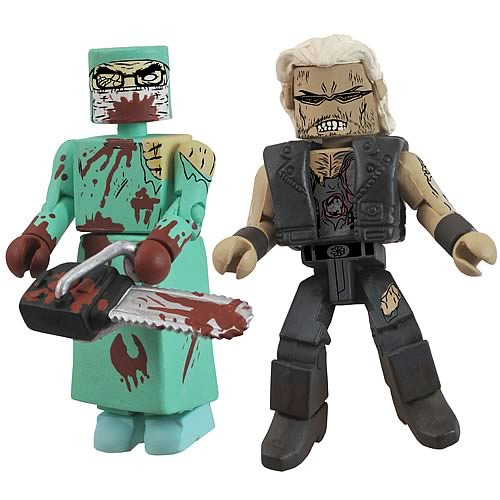 This two-pack of 2-inch Minimates mini-figures pairs Biker Zombie with Surgeon Zombie, and includes two interchangeable heads and a chainsaw. Limited edition of only 3,000 pieces! Ages 8 and up.